ANT450D3 406-512 MHz 3-6 dBd 2-Element Folded Dipole Array Antenna - Talley Inc. The Telewave ANT450D3 consists of dual element dipole array antennas with a precision phasing harness for optimum performance. 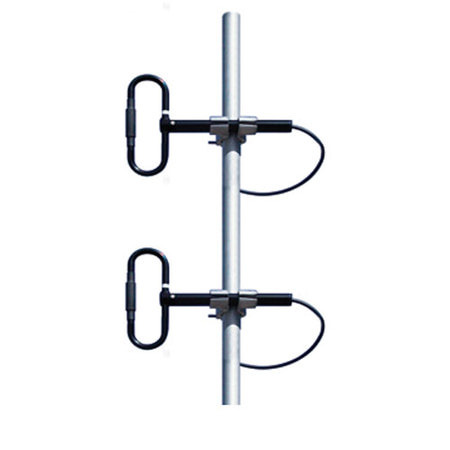 The antenna horizontal pattern is field adjustable, for any current or future coverage requirements. The wide bandwidth and high efficiency of these antennas make them ideal for many applications, including trunking, business, public safety, government, and amateur radio.Each dipole element is constructed with 6061-T6 aluminum, and welded at the base for maximum strength. Each antenna is also completely sealed with our high-tech Txylan™ coating, which resists water and ice buildup, and provides exceptional protection from corrosive gases, UV radiation, salt spray, acid rain and windblown abrasives. The phasing harness is fully sealed by Telewave's Millenium Seal™ technology. All components are at DC ground potential for lightning protection. Each dipole element includes a heavy-duty custom clamp set for mounting to a 1.5"-2.5" diameter galvanized steel support pipe or tower leg.Up to 15 degrees of electrical uptilt or downtilt may be specified for ANT450D3. Desired tilt angle must be included on the order, and consultation with our antenna engineering staff is requested.